Whether you need an extra level within the hierarchy of your workflow, or have objectives that need to be completed to finish an overall task, subtasks are the perfect solution. 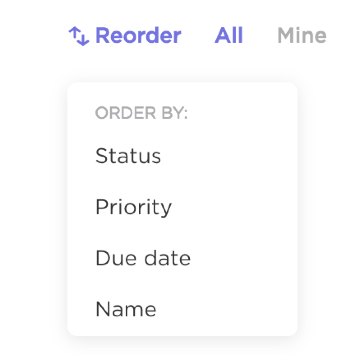 Subtasks add an additional layer to your structure, allowing you to define more detailed goals inside of your tasks. As with normal tasks, you can add layers of information to subtasks such as assignees, due dates and priorities. Keep in mind that subtasks in the Team Dashboard will only appear when you are sorting or filtering. When you switch to the Me Dashboard, you can simply flip the subtask toggle without needing to add sorting or filtering. This is because the Me Dashboard acts as an automatic filter. It only shows items assigned to you! If you have one task that you want to convert to a subtask, it's quite simple. If you have multiple tasks that you want to convert into subtasks, utilize the Multitask Toolbar to select multiple tasks, statuses, or entire Lists and convert them into subtasks. It's easy to convert a subtask to a parent task as well. 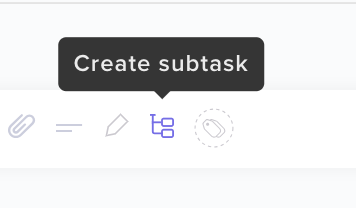 You can additionally select "Move subtask" to move it to a different task within your Team. Add a list of subtasks to a task by simply copying and pasting from any outside doc or spreadsheet. You can also create a brand new subtask for tasks in List View by selecting the icon below. Utilize the multitask toolbar in task view to make quick changes to your subtasks! You can also use the multitask toolbar in task view to automatically "sort", or re-order, your subtasks with the click of a button! Assigned comments show up in the “To Do” area of a task and behave essentially as a subtask with simple statuses. They provide quick accountability for any comment in a task's activity feed. For more options to create action items within a task, be sure to review our Checklist feature!